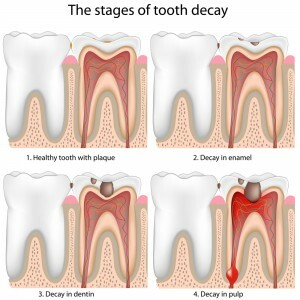 Dental caries (more commonly known as cavities) are caused by a variety of factors and can lead to serious oral health consequences if not treated in a timely manner. At David M. Weinman, DMD in Westfield, NJ, Dr. David Weinman provides patients of all ages with comprehensive preventive and restorative dentistry solutions, including treatments that help to inhibit tooth decay and repair damage caused by cavities. What is the answer that immediately comes to mind when asked this question? Is it sugar? If so, you’re not far from the truth. The bacteria in your mouth feed and thrive on the sugars and carbohydrates you consume throughout the course of your day, producing acid as they do so. It is the acid produced by these bacteria that actually causes tooth decay. While the enamel that protects the inner layers of your teeth is the strongest substance found within the human body, it is nonetheless susceptible to acid erosion. Brushing and flossing your teeth twice per day – as well as visiting Dr. Weinman every six months for a checkup and cleaning – can substantially help to reduce your chances of developing cavities, even if you do indulge in the occasional sweet treat. Rinse your mouth with water after each meal and limit beverages like sodas and sports drinks, both of which typically contain citric acid and can cause further demineralization of your enamel. Other common cavity culprits include chronic dry mouth and teeth grinding. In cases of dry mouth, a lack of saliva puts teeth at a greater risk of damage caused by acid-laden plaque. Teeth grinding, or bruxism, weakens the enamel over time and can make it easier for detrimental bacteria to work their way into the deeper layers of your teeth. Fortunately, Dr. Weinman can treat both of these problems as well, improving your comfort and bolstering your chances of avoiding cavities altogether. If you’d like to learn more about simple ways you can protect yourself and your family from tooth decay, contact our office in Westfield, NJ today. Dr. Weinman and his caring, experienced staff look forward to helping you defend your smile against damaging tooth decay with a full menu of general and preventive dentistry services designed to suit your lifestyle. Our patient-centric practice also happily welcomes patients from throughout the surrounding areas, including Cranford, Scotch Plains, Mountainside, Fanwood, and beyond.